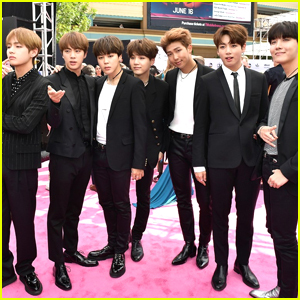 K-Pop Group BTS Open Up Pre-Orders in North America For New Album | BTS, K-pop, Music | Just Jared Jr.
BTS are making their fans all around the world super happy right now — and it’s all because pre-orders for their album are open! The K-Pop group have revealed that their forthcoming studio album, Love Yourself: Her will be made available for the first time in North America, exclusively on Amazon. The album pre-order includes stickers, a poster, a 100-page photo book, a random photo card and a 20 page mini-book, and will also be made available on iTunes and Spotify. BRB, putting our pre-order for 10 copies in right now! Love Yourself: Her will be released at 5 AM EST on September 18th.